How are we supposed to be partners? He can’t see the cards and I don’t know the rules! The summer after junior year of high school looks bleak for Alton Richards. His girlfriend has dumped him to hook up with his best friend. He has no money and no job. His parents insist that he drive his great-uncle Lester to his bridge club four times a week and be his cardturner—whatever that means. Alton’s uncle is old, blind, very sick, and very rich. But Alton’s parents aren’t the only ones trying to worm their way into Lester Trapp’s good graces. They’re in competition with his longtime housekeeper, his alluring young nurse, and the crazy Castaneda family, who seem to have a mysterious influence over him. Alton soon finds himself intrigued by his uncle, by the game of bridge, and especially by the pretty and shy Toni Castaneda. As the summer goes on, he struggles to figure out what it all means, and ultimately to figure out the meaning of his own life. 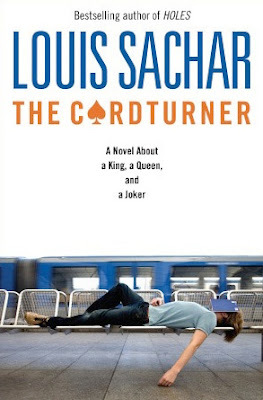 Louis Sachar returns with an amazing novel that everyone of all ages will love; witty, insightful and refreshing addition to the YA world, The Cardturner is a definite MUST READ. I loved the main character of Alton, probably one of the best characters from all the books that I have read. He's sarcastic, genuine and well written, he had the depth of a real person, you felt yourself aligned with his emotions, actions as well as laughing at his attitude to towards his ex-girlfriend and best friend. The other characters were all unique and each contributed to making the novel the fantastic story that it unquestionably is. The novel is straightforward, while in non-bridge gibberish (I'll explain in a minute), The Cardturner is extremely easy to read and has a light-hearted mood that makes you feel content, happy. However, the whale that is presented to most people while reading this book is what happens when the little picture of a whale appears (don't get scared now!) Optional to read, the text that comes after the whale is an explanation of what is happening in the game in bridge terms - lessons for bridge if you will. Now, don't stress, at the end of this part, there is a few sentences in a box that explains what has happened in very simple, non-bridge terms. Another aspect that was great about the book and also widens the audience is that it is narrated by a guy, and about a guy (mostly!). It's really invigorating to read a book centered around a male main character as it is quite rare. As you may have noticed from my ranting from how much I love every aspect of this book, I suggest that you get a copy of this book ASAP or sooner! You will find that Sachar has done it again and that's why I would recommend this book to anyone over the age of 12, (12+), male or female. Enjoy! Fun Fact: Louis Sachar also wrote Sideways stories from Wayside School, the children's series. I loved this book too, I actually read it on a recommendation from a friend who said it was awesome, I'm glad I did! I Love Louis Sachar and I can't wait to read Holes. Life as we knew it... until Another Earth.